Here are a few more tips we promised in the earlier blog. 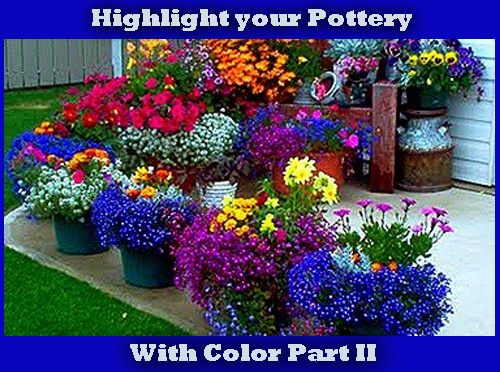 They should aid you in selecting color to put in your garden pottery & planters. Did you know that color effects your emotions? Bright colors such as red & yellow excite us and make us feel warm, where blue, green and pink are considered cooler and calmer! Maybe you want to create a planter that makes you feel warm and exited. Use exciting colors as yellow and scarlet. 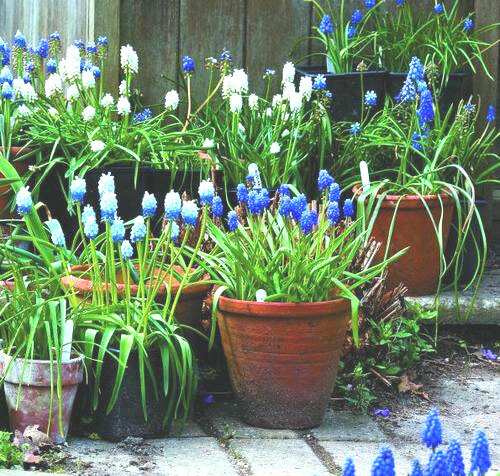 In the backyard where you want a more relaxed feel select the pots with rose, and blue shades. Monochromatic potted arrangements emphasize a single color with flowers or foliage of various hues. Though the emphasis is on one color, its not the same color but different hues of the same color. Even an all white garden pot is best emphasized with shades of silver, cream and pale yellow. Stunning! When setting up your color palette, plan it out so that your potted display is focused and unified. The area of display inside a garden planter is small and confined. The details, colors and combinations should accent the rest of the yard, finding the right mix is sometimes difficult but rewarding. If you are stuck about what color palette to use, try white, which is very calm and neutral. It combines with many colors to develop different moods. White and green create a fresh feel and by adding yellow to the mix produces a cool tone that still lively. White combined with pink and blue gives off a romantic feel. Lastly, for a restrained, yet vibrant attention getting feel, try purple. Place with gray and pink,it produces a sophisticated look. For a lighthearted stylish feel poisiton it with yellow and light brown. Read more.....Going for the gold this fall. Read more....What is your style.